Koh Phangan, also known as the Island of Love is rumoured to be sitting atop a giant rose quartz crystal. Some say rose quartz emits vibrations of unconditional love, joy and warmth, and they credit this in explaining the magic of the island. Koh Phangan is an extremely enchanting place, so enchanting in fact that it doesn’t take long before you start to consider these mystical concepts about vibration, energy and resonance. The theory goes that we each vibrate according to our own unique energy flow, and as a result certain ideas, people and places will resonate with us as they are on our ‘frequency’, or atleast within range. This concept of energy flow thus lends itself quite nicely to the idea that special places have the power to lift us up to a higher frequency. Sitting here now, warmed by the tropical sun and surrounded by palm trees I have no doubt that this is the case. Over the past 3 months on Koh Phangan, I’ve met so many people who have had incredible, mind opening and heart warming experiences, and they always share their concern over how to maintain the same state once home. There is some concencus that while working and living our ‘regular’ lives we narrow our focus to such a degree that we close ourselves off. We become busy and rushed, losing the time to chat with those around us, we resign to hierarchical systems that identify specialists and laymen and we rely heavily on these systems, often outsourcing our opinions to them. We lose touch with the evidence of the oneness of humanity and subsequently disconnect from ourselves and the magic of the universe. Of course, this does not apply to everyone but it does apply to some. This latest project, Love Must Rise, is a new venture for the Rock Vandals-an experiment with functional street art. It aims to remind passerbys that the world needs more love- more self-love, more love for humanity, more enduring love, more family love, more affectionate, playful love, more romantic love, more comradely love…more love of all kinds. Love Must Rise directly calls for this as everyone who passes it can plainly see. For one special, lucky stranger though it is slightly more relevant as Love Must Rise is actually a shirt tied to a coconut tree, with a card encouraging them to take it home. 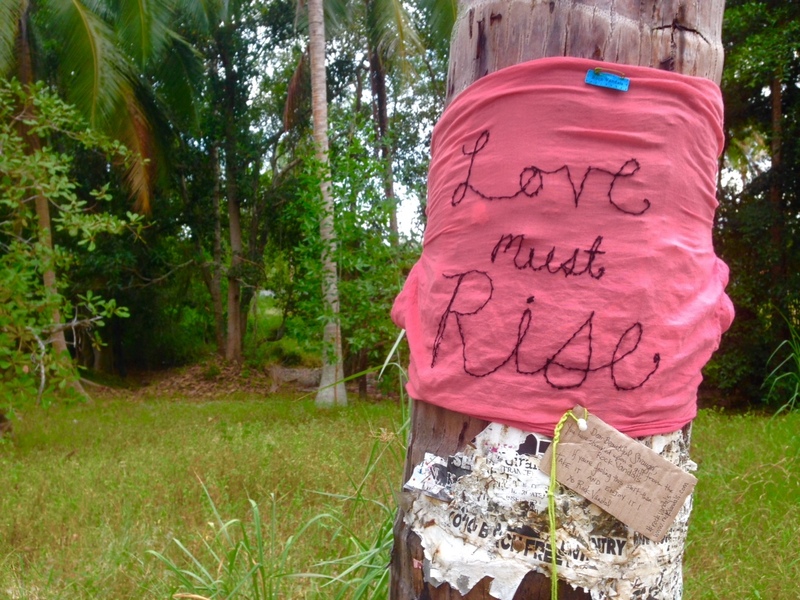 Love Must Rise was installed on September 12, 2016 in Sri Thanu, Koh Phangan in Thailand and within 24 hours it had a new home. Where it ends up would be lovely to know but is not necessarily in the cards; perhaps the Beautiful Stranger will find this post and reach out, but perhaps not. Regardless, it is my hope that Love Must Rise will serve as a reminder of the Island of Love and inspire them to be a beacon of love wherever they go. Have you ever been to a place that emits a specific energy? I’de love to hear from you on this one as it’s obviously an intriguing topic that everyone has experience with. If you want more of a taste of the beauty of Koh Phangan be sure to check out my Instagram account where I regularily upload lovely images of my crafty (and non crafty) adventures! What a great post! It really makes me want to visit Koh Phangan just to “feel” the energy there. I definitely had a similar experience while WWOOFing in Waitata Bay in Russell, New Zealand. The place had such a beautiful energy, and surprise surprise, the owner also had a small statue/art area with many rose quartz crystals! Although at the time, I didn’t quite understand there was a deeper meaning behind them. The more I travel, the more I feel myself opening up in general, and I really do hope I am able to hold on to this ‘openness’ once I get back home. I think the secret is to change something up in your routine as often as you can, so you don’t get trapped in doing the ‘same old, same old’ every day. And also just appreciating the little things, like taking a walk outside just to breathe in some fresh air. Hey Susanne, thanks for sharing your experience and beautiful thoughts on how to be open. I love it!